No story to this post. The other day I was bugging my dad to give me more ideas for baking—things like bread, or cakes, or cookies. He suggested fudge...with walnuts. I had been wanting to try The Nourishing Gourmet's Fudge Recipe for a while, though I also wanted to try and make a few changes. So, I decided to divide the recipe, and follow the recipe for the first batch, then do what I wanted with the second. Both batches turned out great; Dad was impressed and so was I, actually. He and I love the carob ones best, but mom chose the chocolate batch. I think it's all a matter of which flavour you prefer...mom loves cocoa, while I'm not a big fan. I do love carob though, and it results in a sweeter tasting fudge. We all agreed, however, that the coconut butter made a more fudge-like texture—the coconut oil fudge felt more like a chocolate bar. Either way, add nuts...they're delicious and crunchy, especially after being frozen. I am only including weight for the recipe because I don't know what the conversion for coconut butter or carob powder is and I don't want to offer something that might be wrong. 1. Soften coconut butter over a double boiler. 2. In a food processor, combine coconut butter with carob powder, maple syrup, vanilla and sea salt. 3. Fold in nuts, and scoop into a small container lined with plastic wrap. 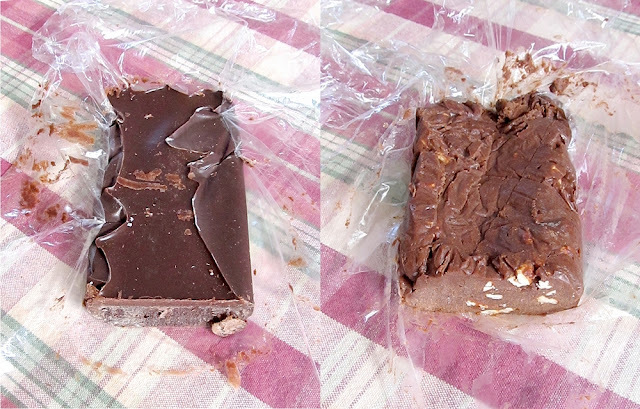 Fold plastic wrap over the fudge and press down. 4. Freeze until firm before cutting and serving. Store in freezer. Very smooth and fudge-like for sugar-free fudge! I also encourage adding walnuts. Yum.